With the arrival of September, comes the countdown to ART MOSCOW; the 15 International Art Fair focusing on contemporary art, and the biggest annual event in the Russian art scene. Founded in 1995, ART MOSCOW has grown to be the largest presentation of contemporary art in Eastern Europe, and is now a major event in the worldwide art calendar. To be held in the Central House of Artists in Moscow, the event will take place from 21st through to the 25th September. As well as celebrating Russian contemporary art, the event also welcomes galleries and participants from around the world. Visitors to the Central House of Artists will get to see art from Cuba, Ukraine, Finland, Spain, Budapest, Switzerland, Germany, Belgrade and Japan, as well as a wide range of galleries from Moscow itself. 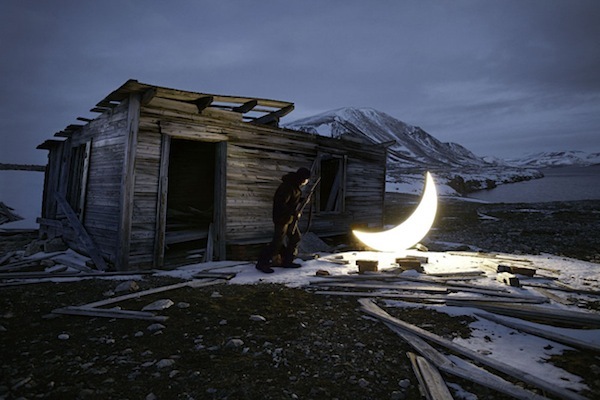 We wrote about a fantastic artistic project back in December 2010 called Private Moon, which featured artists Leonid Tishkov and Boris Bendikov, who had created their own moon and carried it around to places where they could take some truly stunning photographs. We were glad to hear that Krokin Gallery, that represents Tishkov in Moscow, will be showing at ART MOSCOW, and so hopefully they're will be a few fantastic moon images on show.